Vembu is leading provider for the On Premise and Cloud Backup and Recovery Solutions provider. Vembu has many of the products in each segment for every organization. Nowadays Backup and Recovery is a most critical part of your IT Infrastructure. Every Organization needs an Backup or Recovery Solutions for their servers and applications. Vembu provides Backup and Recovery Solutions for virtual as well as physical environments. Vembu solutions works on top 2 virtualization environments which are VMware and Hyper-V. So you can easily choose which environment you want to secure. Vembu has vast product offering for the small and medium enterprises. 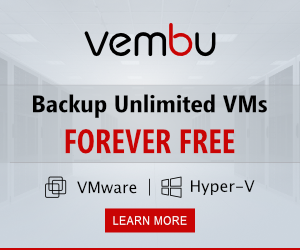 Vembu has announced recently newer edition of their backup and recovery solution which is Vembu BDR Essentials. Vembu BDR Essentials mostly focuses on the smaller organizations who has 6 CPU Sockets or 50 virtual machines. So If you have this kind of small environment you can go for Vembu BDR Essentials with low cost. Vembu BDR Essentials comes with the good feature set which protects virtual environments. With this new package, small businesses can cut up to 50% on their regular backup expenses. Licenses for Vembu BDR Essentials are provided at the host-level and VM-level depending on your business infrastructure. You can also opt for Enterprise or Standard edition based on your requirements. Near Continuous Data Protection with 15 Minutes RPO. Quick VM Recovery within minutes. Test Backups through Boot Check, Mount Check and Image Integrity Check. Microsoft Applications Supported such as Exchange, SharePoint, SQL and Active Directory. For Larger Environments you can go for Vembu BDR Suite which is designed for the larger enterprises so you can have flexibility of your choices based on your IT Infrastructure. While the BDR Essentials is custom-designed to protect your virtual environments, the BDR Suite is a comprehensive solution using which you can protect your entire IT environment.